This product is an elliptical machine and is considered in the fitness industry as being gym-grade in terms of quality and overall effectiveness. Supported by a noiseless drive system and easy to use LCD screen, this machine will guarantee you a modern, top class method of burning calories and increasing lean muscle. In this review I will discuss the particulars of the Sole E35 with regards to its physical makeup and technical workings. I will then highlight what I believe are the pros and cons of this elliptical machine as well revealing how this product has fared to date in the market place. I’ll finish up by giving my overall verdict as well as discussing the cost effectiveness. A key aspect when it comes to purchasing a home exercise machine is the space that it will take up both when you are using it and also when you want to store it away. When it comes this product measures in at 27 inches (length) x 58 inches (height) x 83 inches (depth) x 8.7 inches (breadth). These measurements mean that this machine can comfortably be used in any room other than the very smallest. It is quite a slimline piece of equipment, completely different to the bulky treadmills that can be a disaster to find a place for in a home setting. In saying this, I would add a little warning to the above. It does not fold once it has been assembled and has not really been designed to be stored out of the way once you’re finished your workout session. The same can be said for moving it about – it does weight 230lbs after all. It’s important that you keep this in mind when you are thinking about where to put this machine. Of course, this will not be an issue if you have a designated room in mind in which to exercise. The Sole Elliptical is powered by a silent drive system that combines a 35lb flywheel with high gear rotation in order to supply smooth functioning. A fan has been built into this system so as to keep everything cool and working perfectly. There are four rear wheels that are attached to rails of a heavy-duty nature. This combination results in a stable and unobstructed motion when the machine is in use. It can also be operated both in forward and reverse motion. A key aspect of this drive system is the lack of sound that emits from it when the machine is in use. This is exactly what you want – nobody enjoys the clunking and whizzing of a laboured machine whilst they’re working out. Pedals – these adjustable pedals come in at 15 inches in length and have been specifically designed to avert any stress on the knees and ankles as you work out. Foot plates and pedals are something that the Sole brand are renowned for and this particular version is exactly why this is the case. The key behind these Pedals is that they have a 2-degree inward design which makes them ergonomically perfect. Handles – in addition to the Pulse Handlebars, this elliptical machine also had stationary handles that you can grip as you work on this machine. These handles have been created so as to not obstruct the machine when it is being used. Water Bottle and Tablet Holders – simple yet effective! Not all additions have to be modern and fancy, sometimes the most practical options are the most necessary ones. A place to store your water bottle mightn’t seem all that vital…until you reach the point in your exercise session where you’re badly in need of a drink!! Blue Backlit LCD Display – this 7.5 inch screen works to show you all the vital information regarding your exercise session, including your heart rate; the distance you have covered; the calories that you have burnt; the duration of your session; and much more. 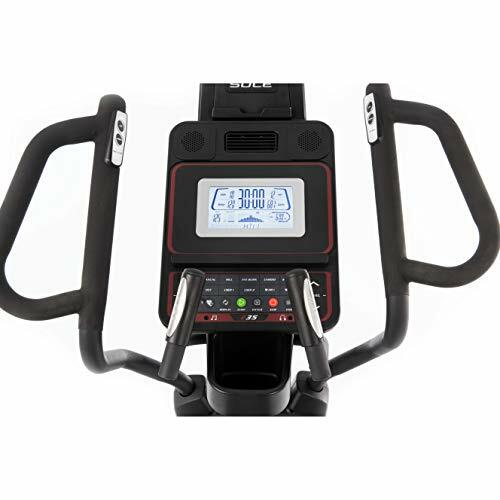 Ultimately, this LCD display is user friendly and greatly adds to the whole workout experience. Pulse Handlebars – easy to grip, these handlebars work seamlessly with you as you power through your workout. Included within the handlebars is a heart monitor so that you can keep a close eye on exactly how intense your session is and whether or not you need to increase the intensity. Chest Strap – this works as an alternative to the Pulse Handlebars in that it is also a heart monitor. Basically, if you want to keep your hands free or do not want to worry about gripping the handlebars to check your heart rate, simply attach this Chest Strap and you can have constant recordings of your BPM. Sound System – this nifty addition allows you to hook up your device of choice so that you can listen to your favorite playlists as you exercise. Listening to music is correctly seen as a massive motivational tool, so this addition is very welcome. This Sound System is compatible with mp3, iPod, or your mobile. Bluetooth Connection – this is a common feature in many machines of this type, such is the modern age of technology that we live. Having a wireless way of connecting to the E35 model is a much-appreciated addition as wires can very easily get in the way when using an elliptical machine. Ultimately, this is what matters when it comes to an exercise machine – does it result in a top-class session. If you are looking for a challenging cardio-based workout, then the Sole E35 is a perfect choice in my opinion. The above guarantees a wide range of options that have varying levels of intensity. A key feature is that it is adjustable with regards to incline. This Power Incline feature ranges from 0 – 30 degrees which you can change mid training session. The Power Incline results in you having the ability to move at a flat level or one that is steeply inclined. Of course, this then means that you can vary the intensity level of you training session to a greater extent. Who it suits: all in all, this machine is suitable for any person, no matter their levels of fitness. Whether you are a complete noobie, or a regular trainer, this product is perfect for toning your muscles and burning off that unwanted fat. When I was constructing this review, I took time to consider what, if any, accessories might be key to go along with this machine. It didn’t take me long to arrive at a heavy-duty floor mat. It weighs in at 230lbs, which is pretty standard when it comes to elliptical machines. However, due to its weight, it can cause concerns for carpeted or wooden floors. Therefore, planning ahead and purchasing a top-quality mat could very well be a prudent move. A perfect example of this is the one supplied by the good people at Rubber-Cal. They have created a heavy-duty mat designed for such machines as this one. So What's The Real Scoop? Restricted stride: the stride of this elliptical suits up to 20 inches in length but not more. This may be an issue for people who are very tall. In saying this, it will still suit the vast majority of people. When it comes time to purchase a product it’s important that you have a look to see how the product in question is performing in the market place. This is simple enough to ascertain – looking at online customer reviews and testimonials being the prime example. A trusted source when it comes to such reviews is Amazon, for obvious reasons. In regards to how it is faring on Amazon, the rating that it possesses as I write this is pretty damn impressive with a high rating. This is as solid a rating as you’re going to see from hundreds of people. It indicates that the vast majority of people who have purchased this elliptical were so satisfied that they took the time to pen a review. Overall, this is extremely promising! OK, so let’s get down to the nuts and bolts – the cost and my overall thoughts of this product. The retail price of this exercise machine runs between $1000 to $1500. With regards to this price, I think it’s a decent charge for such a piece of machinery. Some people might balk at this figure, but you’re really not going to find an elliptical machine or treadmill of any quality for much less. Remember, these machines are gym standard; offer a wide vary of training options; and will last for a very lengthy amount of time. This means that they will not be cheap. A solid indicator of this product’s quality and cost effectiveness is the fact that it is constantly picking up “Best Buy” awards from different organizations and wholesales. This is an impressive feat when you consider the sheer number of products that are out there. Ultimately, if you are looking for a home cardio machine that delivers real results in a short period of time, and that can adapt in intensity as your fitness levels rise, then this model is well worth your consideration. I hope that you found this review informative. Don’t hesitate to contact us if you have any additional questions.